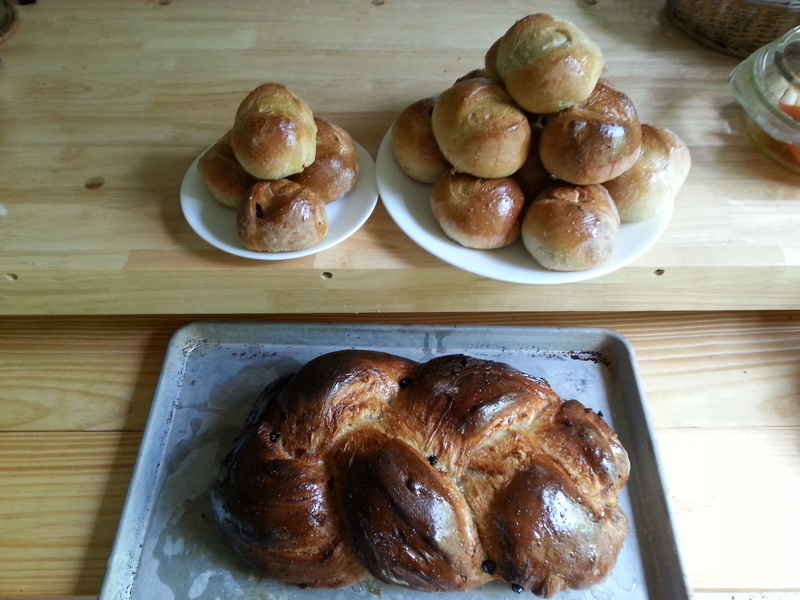 Sweet bread with almond flour, home made candied citrus peel, freshly laid eggs, etc, baked in the wood fired oven. Will I ever get to write that I had a relaxed week? Maybe not, but my weeks are so much more exciting this way! It’s another week for you foodies out there, though the Nid is also transforming at a rate of knots. It’s been a fortnight of chutney making, as mango season is at its peak and neither Mandy nor I can stand to let anything go to waste. 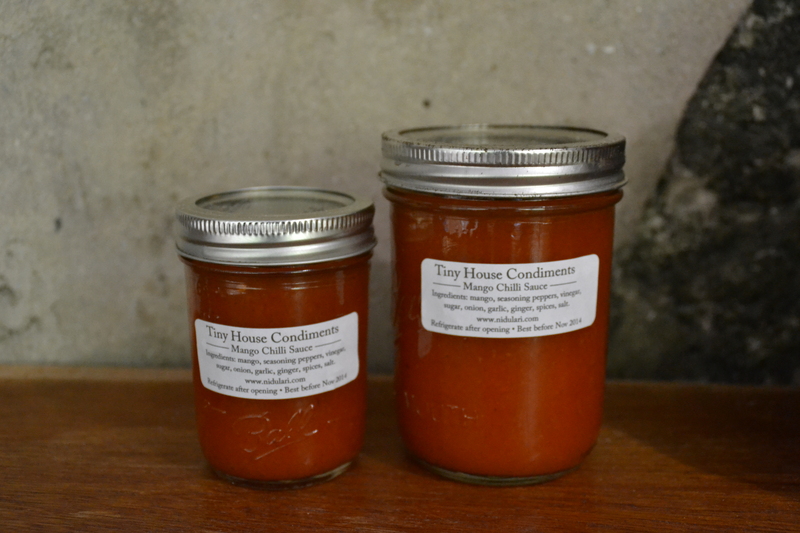 We have some recipes that we go back to year after year, such as the Mango Tamarind Chutney and the Banana Ketchup. Each season we also conduct a couple of experiments, making first a small batch to see how it comes out, and if successful following up with a larger batch. Somehow, we don’t usually end up with any that are terrible, and most times the experiments come out really tasty! Our first experimental batch this year stemmed from an over-prolific pepper patch; small red and green seasoning peppers that look like Scotch Bonnets but are in fact quite mild. We took a week’s harvest of those (about 1/2 a gallon) and pureed them up with the first few ripe mangoes of the season…some other chutneyish ingredients and next thing you know we were straining and bottling a gorgeous orange-hued sauce with a lovely soft medley of tropical flavours! 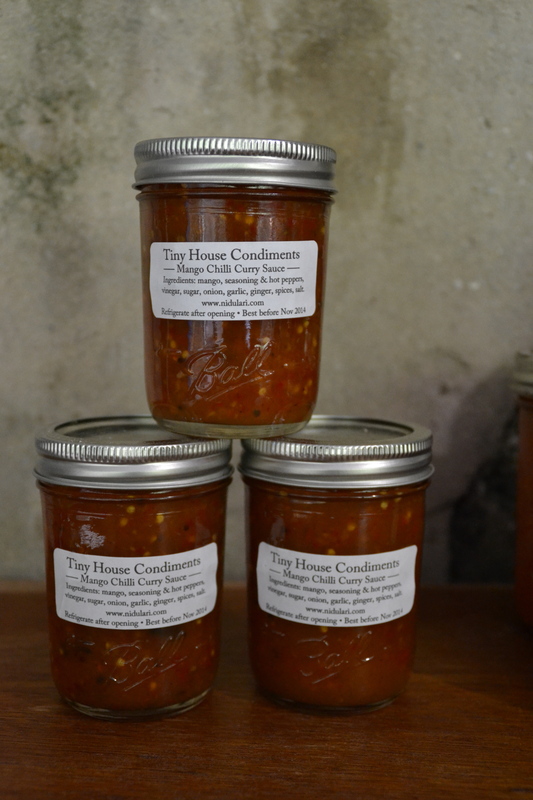 I’m currently eating it on everything, and hoping that the next harvest of peppers in a couple of weeks is equally prolific so that we can make the next batch! I was still hungering for something really spicy, so I decided to take matters into my own hands with the chutney experiments. I took the basic concept of the Mango Chilli Sauce, added good amount of my go-to dried Indian red chillis, a variety of curry spices, and some extra salt. I wanted something to spice up a plate of rice and beans, or to add some zest to a sandwich or a slice of roast meat, so I decided to retain some texture for visual interest including a few whole cloves and lots of whole mustard. The result was perfect; a hot, salty, spreadable chutney with a definite hint of India in the subtle undertones of cardamom, clove, and turmeric. Forget about that bottle of hot sauce on the shelf, this is so much better! Each year Mandy gets into a slight panic that all the mangoes will be too ripe for her signature Green Mango and Tamarind Chutney, which we’ve been making every year for at least 10 years. So there’s always a big rush to get at least one batch of it made and in the cupboard as soon as the mangoes start dropping so that we shall never ever run short of mango chutney! I can’t remember a year when we’ve run out, I have to admit. This year, however, we’ve been unable to find our usual source of tamarinds (a thin, brittle pale-brown pod with sticky dark-brown flesh inside surrounding large black seeds), already processed to remove the pod and seeds and sold by the jar. In fact, tamarinds of any kind were hard to find, so the first batch we ended up making without, ending up with a Hot Green Mango Chutney. For the second batch we did manage to find tamarinds (with seeds) to process for the chutney, so we were finally able to make the real thing! 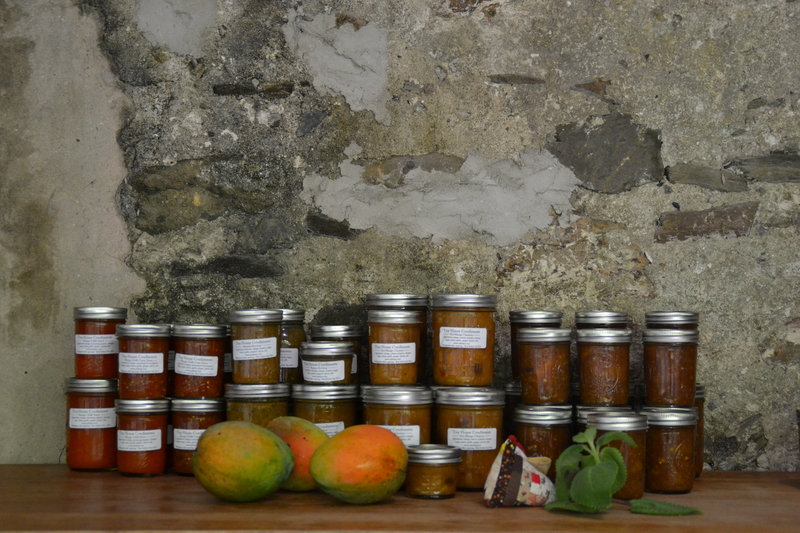 If the mangoes hold out we’ll still make another batch of that, plus possibly some jam? I’m still trying to find something to do with papaya, I’m thinking pickled green papaya, and possibly ripe papaya barbeque sauce, utilizing its natural meat-tenderizing properties. Now, you’re probably wondering what in the world to do with 5 or 6 different kinds of chutney? All those choices, how would you ever decide? Well, eat them on everything. Ok, not your cereal, maybe not on your icecream either, but pretty much everything else! 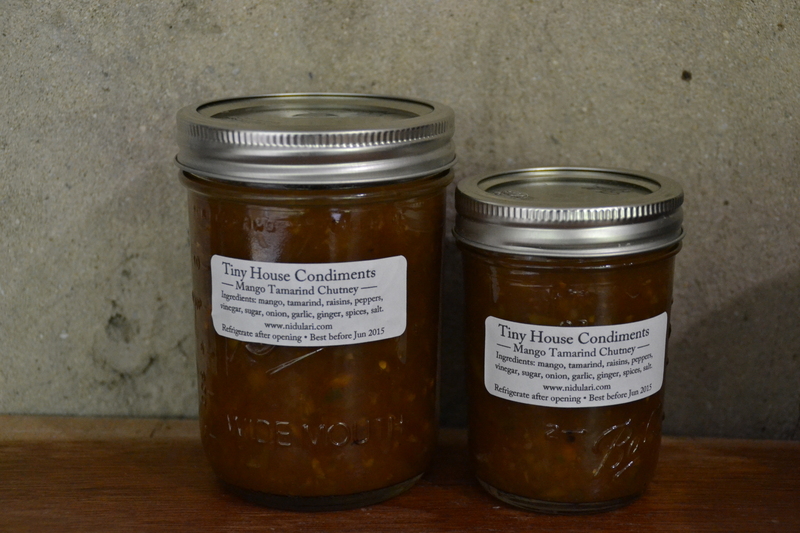 We rarely serve a lunch or dinner, even just for the family, without at least one kind of chutney. If we’re having a spicy meal, I like to serve a mild chutney – either the slightly sweet Mango Chilli Sauce, or the sharp, tangy Mango Tamarind Chutney. I like to spice up a somewhat bland meal, say rice, beans and salad, with something zingy such as the Mango Chilli Curry Sauce or the Hot Mango Chutney. Last night we had a spicy goat curry with rye bread and a finely chopped arugula and baby bokchoy salad. A spoonful of yoghurt on one side and a spoonful of Mango Chilli Sauce on the other completed the meal and took the bitter edge off of the summertime greens. A sandwich is not a sandwich without a slathering of chutney. Forget the mayo (unless it’s homemade garlic and herb mayo, preferably with olive oil and fresh eggs from your own backyard), and instead pair your cheese, meats, or veggies with an appropriate chutney! I prefer to pair cheddar with the mango chutneys, chicken or fish with the banana ketchup, and a bean and salad pita or wrap with a good spicy sauce that will penetrate the layers, such as the mango chilli curry sauce. The possibilities are simply endless – mango chutney mixed with yoghurt or sour cream makes one of the best dips ever, for veggies, tortilla chips, or pita wedges. 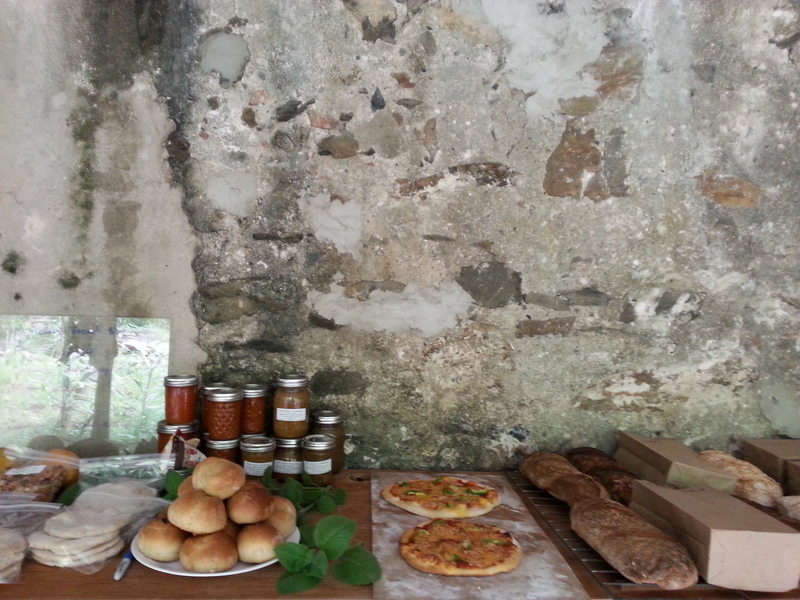 Last Saturday: toasties, pita, chutneys, sweet rolls, lunch pizza, rye sourdough, and whole grain sourdough! Now that you’re drooling uncontrollably, just a few words about the Nid before you hop on over to our Products page where you can place an order for some of these delicious goodies! It is possible to ship the chutneys to the U.S. at your expense, via USPS in flat-rate boxes – please email me for details if you’d like to arrange that. Putting up the last two posts, above the door frame. Little tricky single-handed, but it happened! 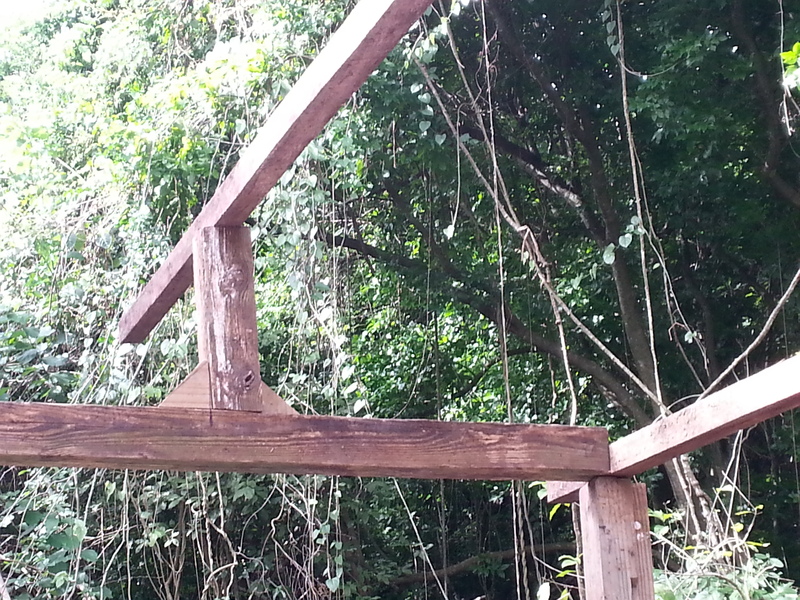 Detail of the rafter coming back to the loft. The Nid has reached the next stage! 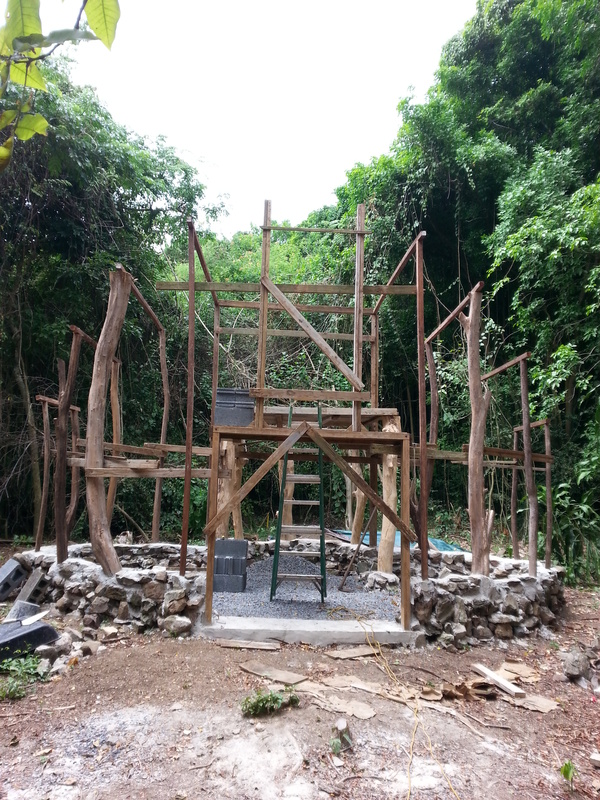 This is an exciting point to have reached as it marks the end of the stone work and the carpentry (for now), leaving mostly bamboo and cement to be done. The posts are all up and built into the foundation wall, the rafters are all on the posts, and finally I am able to put a tarp up, providing a little relief from the elements. This also allowed me to move my workbench “inside” and take down the old sail that I’d been using for shade and shelter from the rain – removing one huge eyesore from the construction site! This morning Mandy and I took a little field trip to harvest a few stalks of bamboo for me to experiment with splitting and attaching it to the upright posts before I harvest the main quantity – it’s best done green, so I didn’t want to have large quantities of bamboo drying out whilst I try to figure out how best to process it in order to make usable lathes. So far so good! First bamboo harvest stacked against the Nid, waiting to be split into lathes. Wow Merryn, what a week glad you and Mandy were able to achieve other things other than building the Nid. You both are such great cooks and so glad we can all share in the goodness. Looking forward to getting more of the sauces and chutneys they are so tasty and enjoy them everyday. 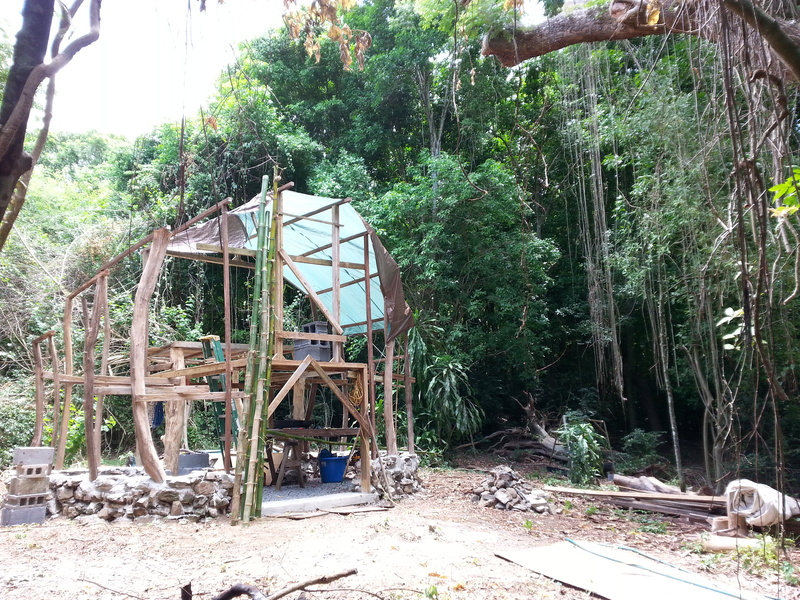 The Nid is really coming along, loved seeing the bamboo hope it works out as you hope. Keep up the great work I’m sure your tired but it will all be worth it in the end. Will see you the weekend of the 28th and enjoy your off weekend and relax do something fun and relaxing for you, you have earned it. Hope all the new sauces and chutneys are a huge success. Thanks, Diana, looking forward to seeing you next week!